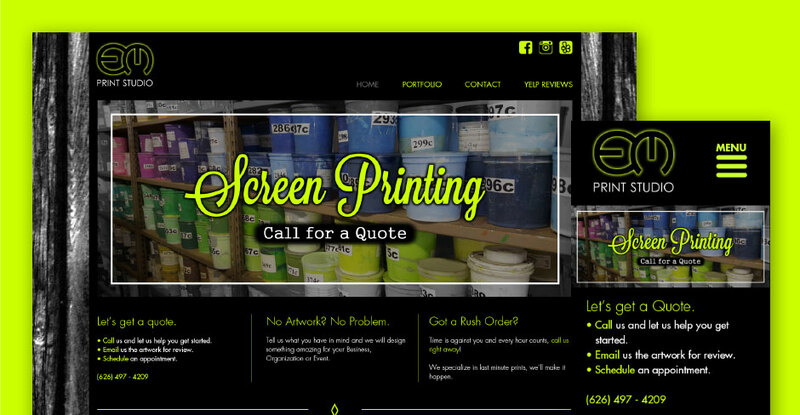 Em Print Studio is a screen printing studio in Pasadena, California that specializes in designing flyers, banners, postcards, business cards, magnets, t-shirts and more. The client has extensive print design experience and had a particular vision for how the website was to be constructed. The challenge for this particular project was constructing a design that fit the client’s vision but also coincided well from a web design perspective. Ready Artwork’s design team kept in close communication with the client throughout the design & development process. The completed design features a simple and effective 3-page website that showcases the client’s services and offers an easy way for visitors to contact the business through the contact form. Additionally, there are sections to view Em Print Studio’s Yelp reviews, companies that they have worked with and an image gallery.